Order fulfillment costs include inventory receiving and storage, order packing, shipping, and depend on order complexity, package size and weight, and sales volume. Small orders might cost $1 to fulfill while complex orders can exceed $10. Fulfillment services’ fee structures also vary greatly, and the best fit depends on your specific needs. Searching for the ideal fulfillment partner can be a tedious process, especially if you’re new to the game. We recommend starting your search with the free fulfillment matchmaking service, FulfillmentCompanies.net. It matches your needs to more than 600 prescreened fulfillment companies to find the right fit. Get free fulfillment quotes today. Order fulfillment costs cover four basic expenses ― inventory receiving, stock storage, order picking and packing, and shipping. Fulfillment companies vary greatly in how they charge clients for these services. Some fulfillment services itemize each of these four cost centers while others combine a few services into an overall charge. Unfortunately for fulfillment shoppers, there are no set industry fee structures. Each fulfillment company charges for its services in its own way. To help you understand how fulfillment costs work, here are three examples of fulfillment fee structures. These illustrate the most common types of charges you’ll encounter as you shop for a fulfillment service, and how fee structures can vary among fulfillment providers. We detail how these fee variations can benefit different types of businesses below. Depending on what you sell, how much stock you store, and how you ship, one provider’s fee structure can be far more economical than another’s. That’s why it’s important to understand how fulfillment fees impact different sales scenarios. Below, we plug in some numbers to illustrate how different fee structures impact a business’s order fulfillment costs. You have to pay someone to do this: These costs represent facility, staff ― including your time ― and other overhead expenses that you’d incur running an in-house operation. You get lower shipping rates: Fulfillment companies get lower rates than small shippers and generally pass on the savings to clients. You can focus on growth: Your time can be spent growing your business, not packing orders and managing shipments and staff. Fulfillment services Scale to meet demand: Fulfillment services allocate staff and space as needed, so you never pay for staff and storage space that you’re not using. 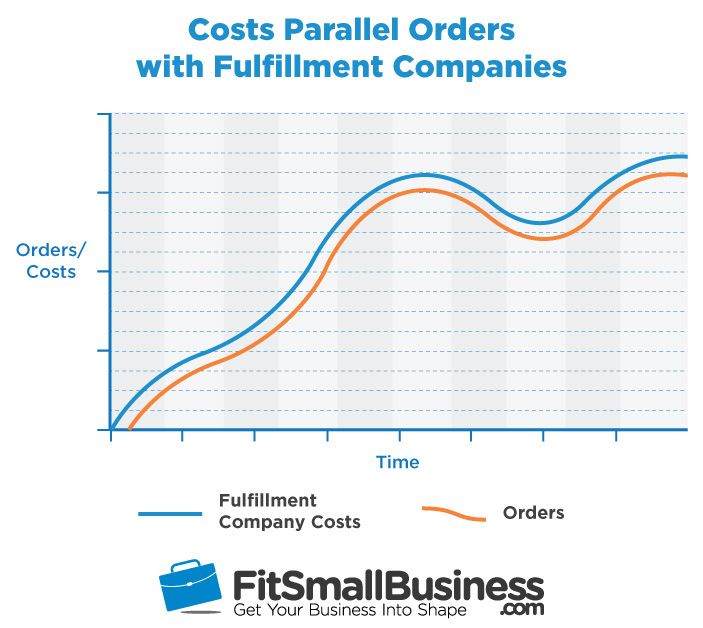 Here’s how order fulfillment costs vary with a fulfillment partner that uses a different fee structure. As this example shows, a business that receives many inbound stock shipments can save with a fulfillment partner with free receiving, even though pick-and-pack costs are higher than those in example one. These are just examples of common fulfillment costs, but they illustrate why it’s important to examine many fulfillment partner options. The free fulfillment matchmaking service Fulfillment Companies.net is the best way to find fulfillment partners that fit your needs and budget. It compares your needs to more than 600 prescreened providers ― all for free. Find your fulfillment match today. Now, we’ll look at some real-world fulfillment costs from actual providers. FedEx Fulfillment, ShipBob, and Red Stag Fulfillment are three top-rated small business fulfillment companies that have shared their rates with us to give you a look at what many small businesses pay for fulfillment. These providers’ fee structures are similar to the examples covered above but, as noted earlier, each has its own variations. Inbound & Outbound Shipping Inbound & Outbound: Negotiated FedEx rates based on order volume Inbound: Discount available with ShipBob shippers. Outbound: Negotiated rates based on order volume Inbound: Discount available but not standardized. As shown by the examples and real-world costs above, there are no cookie-cutter solutions when it comes to order fulfillment. The fulfillment solution that fits one company may not be right for another. That’s why we recommend starting your search with free quotes from FulfillmentCompanies.net if you’re new to order fulfillment. Three possible options are FedEx Fulfillment, ShipBob, and Red Stag Fulfillment. FedEx Fulfillment entered the small business fulfillment market a within the last few years. Its extensive global fulfillment logistics network has been thoroughly tested and tuned by enterprise-level shippers for more than a decade. Now, FedEx brings cutting-edge ― and surprisingly economical ― fulfillment services to startups and small sellers shipping as few as 100 orders per week. Like ShipBob and Red Stag Fulfillment, FedEx Fulfillment also offers clients a range of added fulfillment services with per-project or as-needed fees. FedEx Fulfillment delivers a full range of fulfillment and specialty packing services to shippers and ecommerce sellers of all sizes. It handles standard store-pack-and-ship accounts as well as accounts needing specialty packing and branded unboxing experiences. Any startup or growing ecommerce shipper should include FedEx Fulfillment on its short list. Setup is free with FedEx Fulfillment, and your account representative takes care of all onboarding, ramp up and platform integration tasks. New clients have a four-month startup phase to reach FedEx Fulfillment’s 100 order-per-week minimum account threshold. As a FedEx Fulfillment client, you’ll be able to negotiate low shipping rates for inbound shipping via FedEx parcel and hundredweight services. You can also tap FedEx Freight for possible discounts on truck freight. Unlike ShipBob and Red Stag, FedEx Fulfillment does not charge any receiving fees on inbound stock as long as the shipments meet their shipment standards ― much like Amazon FBA. FedEx Fulfillment’s inventory charges also differ from ShipBob and Red Stag. It charges for the total volume that your inventory occupies in the warehouse. This is figured at 19 cents per cubic foot and is billed per week. If your inventory fluctuates greatly week-to-week, you won’t pay more than you use one week to the next. FedEx Fulfillment charges $1.80 per order processed and adds 40 cents per item in the order. The $1.80 fee covers a basic box and nonspecialty void fill. Specialty packing like bubble wrap, bagging, or decorative tissue incurs added fees. You’ll get low negotiated rates for FedEx shipping based on your overall shipping volume. Plus, you have access to all of FedEx’s shipping methods ― Ground, Express, and even discounted FedEx SmartPost services. Any specialty project needs can be discussed with your dedicated FedEx Fulfillment account representative. FedEx Fulfillment has few limits on what it can do for its clients ― you have to work out the how ― and then how much. Start by scheduling a quick call from a FedEx Fulfillment small business account manager. It will review details like stock levels and item types, packing particulars, order volumes, and budget, and develop a fulfillment plan to meet your current needs and growth goals. Click here to get started. ShipBob fulfillment specializes in ecommerce sellers with low inventory counts and a high volume of sales. With no specific pick-and-pack fees, they’re competitively priced for sellers who ship multiple items per order. 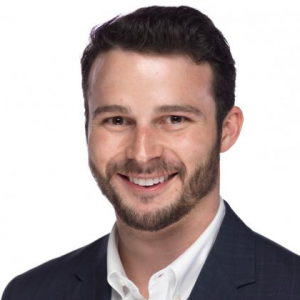 ShipBob also specializes in batch fulfillment, processing a large number of orders at once, which is why they’re a top pick for crowdfunding campaign fulfillment. Along with its standard fulfillment services, ShipBob delivers a full range of specialty fulfillment services billed on a project or as-needed basis. ShipBob delivers a complete fulfillment solution tailored to meet the needs of small businesses. Below is a closer look at how ShipBob handles specific fulfillment tasks and what you can expect from its fulfillment service. Setup is free with ShipBob. Setup refers to the onboarding required to get your business’s entire logistics, including website, suppliers, and inventory integrated into ShipBob’s system. Inbound freight shipping charges are based on many factors, like freight origin and destination, products being shipped, and service speed. You can use ShipBob’s list of top carriers to bring inventory into its warehouses or use your supplier’s carrier or your own. ShipBob’s freight rates are in line with any small business plan, and it helps you find the cheapest rate based on your shipment size and origin location. ShipBob charges $35 to receive each inbound palletized shipment, and that’s per shipment, not per-pallet. So, a 10-pallet shipment is just $35 to receive. Container shipments are charged $25 per man hour to unload and receive, which usually runs around $350 to $450 per container. Standard inventory storage at a ShipBob facility costs $40 per month per pallet or $5 per month per bin. Pallets are typically 64 feet³. Bins are typically 2 feet³. Bins are limited to one stock keeping unit (SKU) per bin. Pallets are usually limited to one SKU, but they can hold two SKUs in situations where the inventory is easily differentiated. This is determined by your ShipBob representative. ShipBob practices a distinct pricing advantage here. It doesn’t charge a separate fee to pick items and pack orders. That means the process of preparing a customer order costs you nothing compared to companies with per-item and per-order pick-and-pack fees. Because of this, businesses that have few receiving and storage needs can get very cost-effective order fulfillment through ShipBob. The cost of shipping orders to customers depends on many factors, box size, and weight, delivery location, carrier, service level, and so on. These charges will vary, but you receive ShipBob’s discounted shipping rates that, in most cases, are lower than what you’d pay shipping on your own carrier account. Batch fulfillment is another area where ShipBob excels. If you’re fulfilling a large number of orders in one shot, say at the end of a successful crowdfunding campaign, then batch fulfillment is a great value. Instead of paying storage fees, you pay a fulfillment fee of $1 per customer order, plus your outbound shipping charges. Start by requesting a call from a ShipBob fulfillment specialist. He or she will review your inventory levels, product mix, and parcel averages, and provide a detailed quote including storage estimates and order pick, pack, and ship fees based on your average orders. Click here to get started. Red Stag Fulfillment specializes in order fulfillment for high-value or bulky products that require special storage and packing or oversized shipping. Red Stag Fulfillment negotiates low prices with FedEx and passes those savings to clients, resulting in significant shipping savings. Red Stag also delivers ultra-secure, video-monitored tracking, storage, packing, and shipping for high-value luxury goods. Like ShipBob, Red Stag Fulfillment also offers clients a range of added fulfillment services with per-project or as-needed fees. Red Stag Fulfillment does not try to be everyone’s fulfillment partner. Red Stag specializes in helping businesses that sell valuable, unique, and hard to ship goods succeed in the competitive ecommerce environment. It offers secure storage, shipping expertise for hard-to-ship goods, and even video-tracked packing of luxury goods to help protect sellers from nonreceipt claims. Setup is free with Red Stag Fulfillment. Setup covers the onboarding steps required to get your business’s entire logistics, including website, suppliers, and inventory integrated into Red Stag’s system. Typically, you’ll send your shipments into Red Stag via a freight shipping carrier. Your freight shipping charges are based on freight origin and destination, products being shipped, and service speed. Red Stag can refer you a freight company and discounted rates are not uncommon, but not standardized. Most small shippers use a freight broker to get the best deals. Red Stag charges $13.25 to receive each inbound pallet. Your account rep will work out pricing for receiving in multiparcel hundredweight shipments or full containers. Storing your inventory at a Red Stag facility will cost $15 per month per pallet, $7.50 for a 1/2 pallet, and 3.75 for a 1/4 pallet. It also charges for pickable shelf locations ― where a certain amount of your product is out and ready to fulfill orders ― at a rate of $1.25 per month. Pallet space and pickable shelf locations are typically limited to one SKU. Red Stag’s pick and pack fees range from $2.25 to $2.64 for the first item in an order. After that, each item added to the order costs 30¢. If you sell several items per-order, your pick-and-pack fees can add up using Red Stag. However, if you ship one or two items per order and you need specialty storage, packing, and shipping services, Red Stag delivers great value. The cost of shipping orders to customers varies based on, box size and weight, delivery location, carrier, service level, and so on. Red Stag negotiates deep discounts with FedEx, especially for oversized and heavy shipments, and passes that savings to you. Businesses selling heavy or large items in volume can benefit from extremely low shipping rates with Red Stag. Red Stag Fulfillment offers batch fulfillment for its regular clients, but not as a special service. Batch fulfillment projects fall under standard fulfillment pricing. Start by requesting a call from a Red Stag Fulfillment expert to discuss the particulars of your business, the goods you sell, and your storage, packing, and shipping requirements. Whatever your needs, Red Stag’s expert will compile a detailed fulfillment and quote and help you plan your next step. Click here to get started. Most startups shipping fewer than 100 orders per month can craft an in-house fulfillment operation on a shoestring, depending on what you’re shipping. Small items like apparel, household goods, gadgets, etc., are cheap to store at home or in a nearby storage unit, and simple to pack and ship. But if you’re shipping fragile, heavy, or large items, your storage, packing, and shipping tasks can be much greater. Another cost that startups and small businesses encounter when they elect in-house fulfillment is opportunity cost. As you grow, in-house fulfillment demands time and energy that could potentially be directed into business-building tasks like marketing or new product development. That’s something to consider as we explore the hard costs. In-house fulfillment operations incur the same costs and expenses that fulfillment companies bill to customers. Storage space and inventory management labor, staffing for pick-and-pack, shipping services, and shipping material costs add up in an in-house fulfillment operation. These costs can vary greatly, of course. A tiny do-it-yourself startup can get by with a garage or spare room storage, a laptop, simple shipping software, and a postal scale and label printer. A larger operation needs adequate space, employees, warehouse shelving, and packing and shipping stations at the very least. So even shipping just 240 orders per month on a shoestring setup, a startup could save money moving fulfillment to ShipBob. Plus, the owner could use that time to focus on marketing and other business-building tasks instead of packing boxes. As you see, running an in-house operation can quickly get expensive, but on a cost-per-order basis, it can be less costly than outsourcing. However, there are other things to consider too like managing the operation and scaling efficiently to handle growth spikes and slowdowns. If not monitored carefully, in-house fulfillment can be very inefficient. It’s nearly impossible to use your warehouse space and employees at 100% capacity. 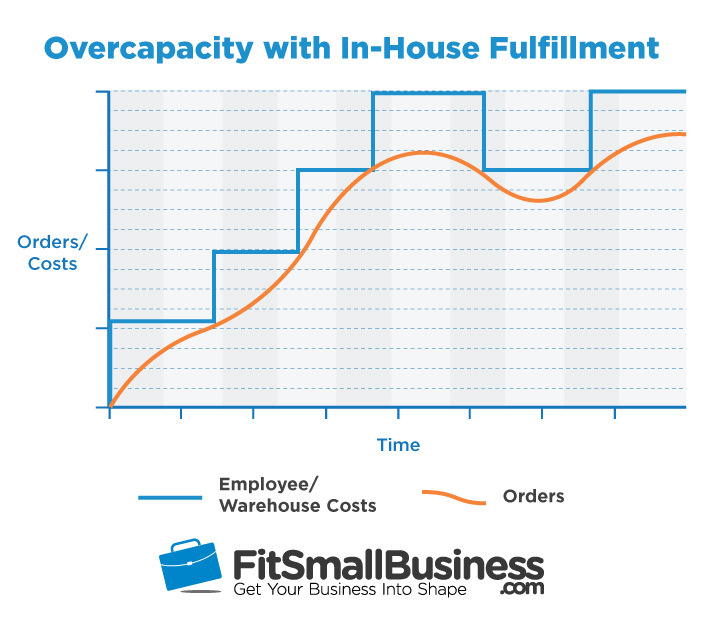 On average, warehouse employees might pull, pack, and ship 10 orders per hour. Plus, they have receiving and stock management tasks. If you ship more than 50 orders per day, you’ll likely need more staff for busy times, but fewer when it’s slow. By comparison, fulfillment professionals are experts in managing scaling ― both up and down ― to meet demand efficiently. Their job isn’t to run a company, source products, and market to customers, like you. Their job is managing distribution ― plain and simple. Fulfillment companies focus on creating systems and processes that support output. For example, ShipBob employees process 30 to 60 orders per hour ― depending on complexity ― making them three to six times more efficient than the average small business warehouse employee. Plus, employees work across multiple accounts, so sudden sales spikes or slowdowns don’t affect cost averages. Due to these efficiencies, outsourced fulfillment costs always stay in line with your order volume. Because you only pay for the storage and labor you need at the time, you never face over or under-capacity issues that plague in-house fulfillment. Outsourcing fulfillment is a far nimbler solution in all ways. And with fulfillment centers like FedEx Fulfillment, ShipBob, and Red Stag Fulfillment even small sellers and startups can move these tasks over to the pros quickly and focus on what they do best ― building their business. Of course, finding the right fulfillment partner is the key to managing your business’s fulfillment needs at the lowest possible costs. Start with FulfillmentCompanies.net to find the best match for your unique business. We have a new lawn and garden product that is packed in a 2″ x 32″ x 32″ box and POP displayed one dozen units. These should do well in hardware stores and garden centers. My question is how to market these to the stores….does the distributor do this or do we? You can certainly find fulfillment centers that offer marketing services or are able to leverage existing retailer lists to clients’ benefit, but that all depends on your budget since costs for these services quickly add up. Most small businesses do much of the marketing legwork themselves via a good website that caters to the B2B crowd if that’s your focus, exhibiting at industry wholesale buyers’ markets, and direct outreach. Smaller independently owned lawn and garden stores and hardware crossovers like franchise ACE Hardware and DoItBest stores have independent purchasing departments compared tot he corporate buyers groups for large chain stores. So you can focus your efforts on those buyers while ramping up. I hope this helps, good luck! You’re welcome! Thank you for reading and commenting. Great article. What cost effective options are out there for a local company who needs someone to house their inventory, deliver, and pick up the same inventory from the customer at a later date. Meaning the item is borrowed or rented than returned to the warehouse. These would be local deliveries only. Thank you! If you have fulfillment centers in your area, you can probably find one that can coordinate with a local delivery service that’s suitable to transport whatever it is you’re renting out. You’ll just have to work out the return/restock details and costs since that will be a normal function or the service, not an occasional need like with shippers that sell goods. I’m guessing that the items you’re renting are oversized or require special handling. If they pack in shippable boxes for transport, you could even use UPS or FedEx for the delivery/pickup side and any fulfillment company can set that up. I hope this points you in the right direction. Good luck! Fantastic article. I have a question. I have a product (custom jewelry) that requires, handwriting, gluing as well as some assembly which is difficult for pick and packers. Would you still think it’s worth it to go to fulfillment? The volume is definitely there but the fulfillment is complex. Thanks for reading, I’m glad you found the information helpful. Some fulfillment services specialize in what we call “fussy” fulfillment, which is what you’re talking about here, essentially a series of small assembly tasks. If you have good volume and a good markup, you can make this worthwhile because someone obviously has to do it. Either you pay someone to do it or take that on yourself and tie up your valuable time. Or, here’s a third option: Streamline your product or packaging a bit. Can the packaging be altered to have less prep and assembly steps? Can you pre-print handwritten cards instead of actually writing them each time? Simplifying the packaging to only the elements that deliver the biggest wow factor might lower your fulfillment costs enough to make outsourcing a good value. I’m not sure if that totally answers your question, but it might give you an alternative route that gets you where you want to go. If not, let me know and I’ll help however I can. Hi Ian , I truly appreciated for all the information you provided. I am planning to start my Fulfillment Company that I am planning to provide service to small and large e-commerce companies. I’ve made some research and now have an idea about how much approx investment I’ll need and I know a little bit of the monthly expenses. My question is, do you have any idea about the Profit margins of the business? I calculated that I can make %13 to %20 in profit. Do you think this number make sense? Thank you so much for your time , I will really appreciate your ideas on this. Hi Juan, ecommerce profits depend on so many things that it’s hard to predict. My $1M+ ecommerce company averaged a net (after taxes) of about 9% to 12% over 16 years in operation, which was pretty standard for small reseller companies in my home & garden category. Others may be higher or lower and much depends on whether you resell or manufacture, and if you can get the word out and drive traffic and sales. We have a lot of information about how to get started on a budget in our ecommerce section.